In this new series called “Now I know my Wine-phabet”, I will explore letter by letter wine and what I believe are some of the most important and/or influential aspects in the world of wine. Since I am only choosing one topic per letter, many will be missed. Hopefully these posts come across as being whimsical and informative. Have fun reading over the next 24 weeks! The Cabernet family has deep ancestral roots. Cousins, brothers and sisters interbred creating off springs, some worthy of being kings and others lost in the king’s courts. 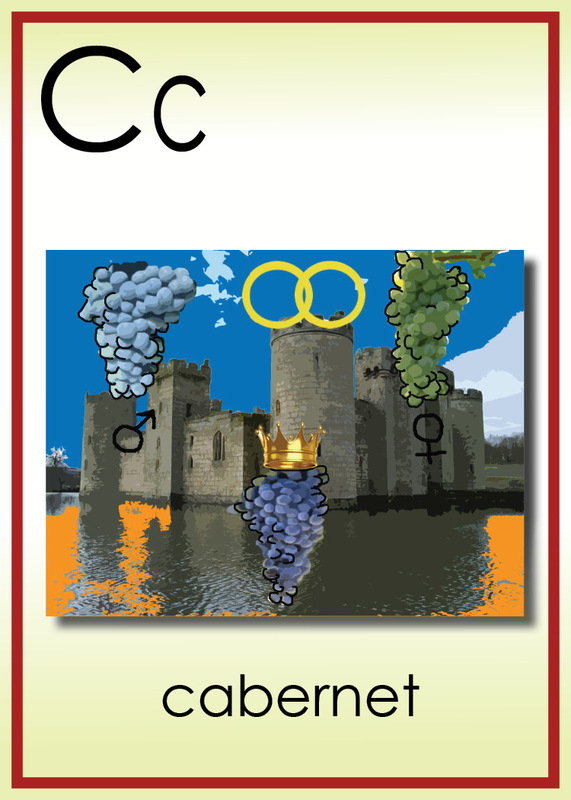 The king is Cabernet Sauvignon…the principle grape of Bordeaux and California. Prior to its rise to greatness, it had been raised by two other great grapes…Cabernet Franc and Sauvignon Blanc. As genetics would have it, each parent passed on his & her traits to their son, Cabernet Sauvignon. The outcome was a son stronger than his father and more adventurous than his mother. This led him to travel around the world and conquer hundreds of regions all the time making more and more winemakers his disciples. All other grapes bowed to him and winemakers foolishly treated the other grapes like him. Today they are learning that Cabernet is Cabernet…the king. Other grapes need to be treated differently and the king is only as strong as his court. So blending his cousins and friends with Cabernet has only made Cabernet more approachable and regal. Cabernet Sauvignon, the most famous red grape variety of Bordeaux, is being celebrated on #Cabernet Day August 30, 2012. Cabernet Sauvignon provides the backbone, strength, colour, character and longevity of these wines from the Médoc and Pessac Leognan. These wines, exemplify the style of wine DiscoverVin aims to import into Australia wines of distinction from quality producers, which provide value for money.